The usual Friday “dinner with my family” post is taking a one week hiatus. I recently had what I consider to be a great idea that I thought I’d share with you while I’m still in the process of implementing it. 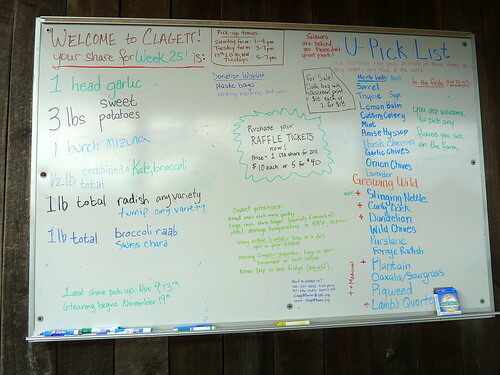 A few days ago, I was at a food co-op distribution point (I’m not in the food co-op but I’m hoping to sign up for one soon) where I noticed that they had lists of the available items on a big white dry erase board. Essentially, the board provided a list of all of the food items that were spread around the food co-op building so that you didn’t have to wander around searching for an item. Instead, you could just look at the board and make sure they actually have the item first. As I looked at the board, an idea popped into my head. Our pantry and deep freezer have a lot of food in there. Often, it’s hard to find food that’s located in the back, particularly when you’re browsing for something to have for dinner. Let’s say, for example, that the kids are clamoring for macaroni and cheese. Do we have any elbow macaroni? It’s probably way in the back on one of the shelves in the pantry… but can I see it, especially when I’m not sure if we have any? Let’s say we’re making a meal plan for the week. Well, what do we have in hand? We could dig through the freezer and the pantry, spending a good amount of time just putting down the basics of our meal plan. Or, in both cases, we could just glance at a whiteboard in our kitchen that lists the contents of such food storage places. First, it makes locating food items at home easier. I need rice vinegar. Where is it? I might have everything in the pantry memorized… but probably not. I might spend a bunch of time searching for it. Or I could just glance at a big board that tells me right where it is and quickly pull it out of the pantry. Second, it makes meal planning much easier. I’m making next week’s meal plan. What should I make? I could dig through the pantry or the deep freezer to come up with ideas… or I could just look at a list on a whiteboard. Both of these things greatly encourage cooking at home, which is far less expensive than eating out. Not only that, it encourages me to plan meals based more on what I have on hand than before, which means that our actual food bills will go down even further because we’re using materials we already have instead of buying more. Today, I started on the first draft of this idea. I made a list on my laptop of all of the significant items in our pantry, printed off a couple pages, and taped them to the pantry door. However, I can quickly see how these pages will quickly be outdated with items used up and items added to the pantry. So, one of the projects for this coming weekend is to pick up a dry erase board and install it on the pantry door. Will it work? To me, it seems like one of those big wins that saves both time and money. It does require some start-up work, but once that project is complete, the benefits seem tremendous.